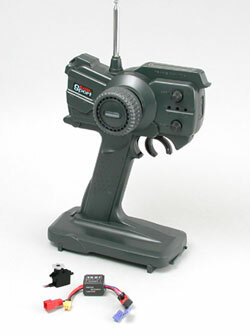 This is the Airtronics Blazer Sport 2 Channel AM Pistol Grip Radio with the ES-01 Electronic Speed Controller with Reverse. This version of the Blazer Sport includes a speed control designed for 1/18th and 1/24th scale electric cars and one Microlite servo. FEATURES: Steering and throttle trims. Servo reversing. Functional NiCd charging jack in transmitter (NiCds not included) Transmitter battery indicator (3 LEDs). Adjustable throttle trigger. Speed control handles stock 27 turn motors used in 1/18th and 1/24th scale cars. Noise suppressing beads cut down on interference from electric motor. INCLUDES: One transmitter No Number One BEC receiver AIRL05** One Microlite servo with Z connector No number One 4 cell RX battery holder(not needed in Dtm or Micro rs4; power from Bec receiver) No Number One extra X-shaped servo horn with mounting screw No number One switch harness AIRM1205 One ES-01 Speed Control with Reverse AIRM0301 Two noise supressing beads No Number REQUIRES: Eight AA batteries for transmitter. SPECS: Transmitter: Model: Blazer Sport Output power: 500 MW Power supply: 8 AA alkaline dry cells DC 12V Weight: 14.46 ounces Frequencies: 27MHz-6 frequencies, 75MHz-30 frequencies Receiver: (mini BEC type) Model: 92721Z (27MHz) or 92723Z (75MHz) Modulation AM/PPM Intermediate frequency: 455 KHz Power supply: DC 6.0-8.4V Weight: 1.13 ounces Dimensions: Length: 1.9" Width: 1.3" Heigth: .75" Weight (without leads) 1.94 ounces Servo: Weight: 0.78oz Dimensions 1.34"x 0.55"x 1.34" Torque: 22in/per ounce Speed 1.15@ 60 degrees Motor Type: coreless Speed Control: Power Supply: 6.0-7.2V Maximum Current: 12A Continuous: 3.6A Voltage Loss: 0.4V at 25 degrees Centigrade at 2 amps continuous Dimensions: L 7/8" (22mm), W 3/4" (19mm), H 5/8" (17mm) Weight: 10 grams Connector: Z connector. Send mail to microrcracing@mindspring.com with questions or comments about this web site. Some product descriptions copyrighted by Hobbico, Inc. Or Horizon Hobbies, Inc This site is an authorized dealer of Hobbico/Great Planes and Horizon Hobbies, Inc. products.